With less than a week to go until the eagerly anticipated release of the Daredevil Netflix series, I thought now would be the ideal time to look back at some of my favourite Daredevil stories. So, with my recent conversations with creators Klaus Jason, David Mack and – to a slightly lesser extent – Bill Sienkiewicz at this year’s London Super Comic Con still fresh in my mind, I figured where better to start than with 2012’s Daredevil: End of Days? Conceived and executed by a veritable DD “All Star Team”, the story takes us into a potential future of Matt Murdock where we see him crawling out of retirement to battle long-time nemesis Bullseye one last time, only to be brutally slain in the process. His dying word – “Mapone” – leads Daily Bugle reporter Ben Urich on a journey to find the answers about what happened to his friend, and sees him revisiting a cast of characters including allies and enemies, as well as some of Matt’s former loves. First thing’s first, it bears mentioning that this is not a particularly upbeat book, so fans of Mark Waid’s slightly more light-hearted, swashbuckling approach to the Man Without Fear are likely to come away disappointed – it not altogether traumatised. Bendis is clearly having a field day here, relishing in the grimy, street-level depravity of Hell’s Kitchen as he pens the long-delayed swan song to his iconic run with the character. The existing Marvel continuity is altered subtly to allow Urich to touch base with a variety of the key figures in Matt’s life, with none of them seeming to have fared particularly well in the years since Daredevil went ‘off radar’. Mack adds script polish, enhancing Urich’s downbeat, noir-soaked inner monologue as the reporter struggles desperately to fit the missing pieces together – all the while being watched over by a mysterious new Daredevil. As strong as the writing is here, it’s nothing we haven’t seen from these guys before. Bendis’ credentials with Daredevil are well established, and Mack is no slouch himself, but for me – this is a book which is all about the artwork. Sienkiewicz and Janson combine to create an utterly stunning aesthetic; a gritty, dirty world filled with detail and character. For my money, Janson’s work has never looked better, with a scratchy, sketchy style that perfectly captures the feel of the writing. Sienkiewicz adds his own inimitable flair to the sections he takes over with, laying out panel after panel of sheer artistic genius while still managing to push the story forwards in the process. It’s not a flawless story by any means, and there are some occasional missteps in terms of the plotting. However, as an overall collection, there’s just something about this series that flat-out appeals to me. Maybe it’s the vague but noticeable parallels to The Dark Knight Returns (my personal favourite comicbook of all time), or maybe it’s the beautifully executed moments along the way, such as Bullseye’s ultimate fate or the stark, eye-opening reintroduction to the Punisher. Hell, maybe it’s just how goddamn gorgeous this book looks, particularly in the glossy hardback edition. Whatever it is though, I’m happy to sing its praises to anyone who will listen. While the response to the series has been oddly mixed in the Daredevil community – at least from those I’ve spoken to about it – I still rank it as one of my all-time favourite DD stories, at least in recent years. While it may not necessarily hold up to repeat readings once the mystery surrounding ‘Mapone’ is revealed, there’s no denying that the bleak, noir-drenched journey that this stunning creative team takes us on over the course of these 216 pages provides a dramatically unforgettable look at the mythos surrounding of the Man Without Fear, and of the lasting effect his legacy has on the city and the people around him. Highly recommended. 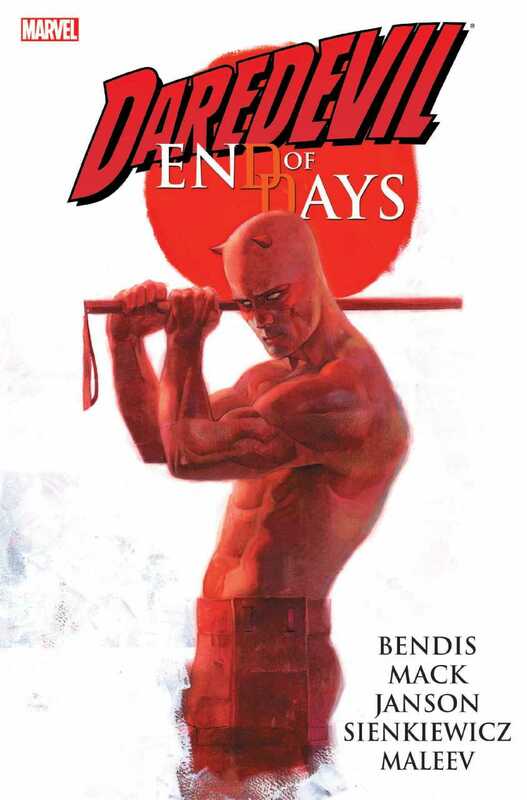 You can purchase Daredevil: End of Days HC from Turnaround Publisher Services (who generously provided the review copy of this title) via their official website. Reblogged this on Duel2's Blog.